When discussing the merits of using Amazon as a platform for online retail, it is imperative to include their advertising capabilities, as they are unmatched in comparison to other platforms. As of 2018, Amazon is the third largest digital ad seller in the US, rivalled only by Google and Facebook. As a company that is in the early stages of developing their advertising spectrum, this is a good omen for businesses that may want to hop on the train. However, it is not as simple as adopting strategies from these larger ad sellers. Many businesses are probably familiar with Google Adwords and Adsense to hone their online presence and open up their website to advertisements, but when selling on Amazon one must learn to advertise on an isolated marketplace. There are a few pitfalls to this that can be difficult to stay aware of, but the benefits far outweigh the dangers if you know how to properly manage their services. 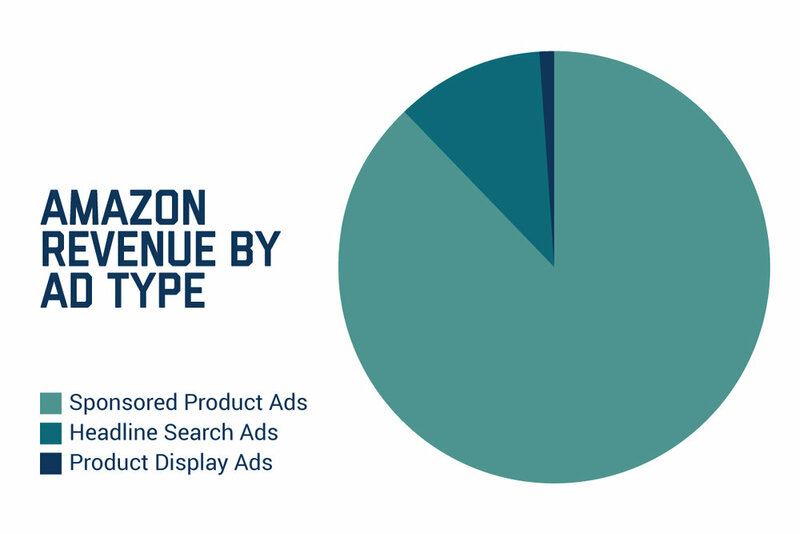 Amazon has three types of ad campaigns you can run: sponsored product ads, headline search ads (now sponsored brands), and product display ads. Each one has its own strengths and best practices, but not every business will benefit from all three. Short answer: yes. Starting an ad campaign is as easy as naming it, selecting products, and inputting your keywords and budget. Amazon gives you full control over your campaign once it has begun, so at any time you are able to change, pause, or restart it. However, the biggest benefit to advertising on Amazon as opposed to other platforms like Google, is that your audience is narrowed down specifically to buyers. When consumers use Google or other search engines, they are using them primarily for research purchases or browsing. In fact, only 15% of online shoppers use search engines to make a purchase. Once they’ve made it to Amazon, which loops in 29% of all online shoppers, they have an intent to purchase. Your ads will reach them at just the right moment to make a sale, so virtually any business and product has a higher chance of consideration at this stage. The long answer is that there are many factors to consider when starting an ad campaign for your business. The type of campaign you choose, how you allocate your budget, and the products and keywords you choose to promote all fit into determining whether you profit or experience loss from advertising. Additionally, Amazon has a few requirements in order to be capable of advertising. Amazon requires that you have a professional seller account, ship to all US addresses, and be eligible for the buy box. The latter is awarded to seller accounts who have been active for roughly 3 months with a high performance level. Once these criteria have been met, however, it is in every seller’s best interest to begin some form of advertising. These are the most popular ads on Amazon, and account for 88% of Amazon ad revenue. There’s good reason for this, being that their unique display groups them right in with non-sponsored products in searches. The sponsored product ads are almost indiscernible from organic search results, increasing their CTR, or click through rate. The CTR records how often your ads are clicked on, and whether or not they result in a sale. They have a product title, image, price, shipping information, and ratings displayed. The only difference is the “Sponsored” icon beneath the image. With such high revenue, these ads are almost always valuable for any business or product. They are especially useful for burgeoning product listings, which may otherwise not receive the same amount of organic visibility. These listings usually wind up farther down the pages of listings, and aren’t noticed as often. Sponsored product ads have the benefit of being CPC ads, or cost-per-click. This means that you only pay if your ad is clicked on. Whether clicks occur or not, however, your ad is still gaining visibility from people browsing the listings. Sponsored product ads, however, only advertise and link to one product, and cannot be customized. Sponsored brand ads, formerly known as headline search ads, are unique in several ways. For one, they operate outside of the listing area. Sponsored brand ads are displayed at the top of the Amazon page, beneath the search bar. Customer attention is drawn to these ads very quickly as a result. Using the same keyword-based system as sponsored product ads, sponsored brand ads appear within relevant searches for certain products. However, they have the unique advantage of having fully-customizable images and text. A brand can display their entire product range or items within a specific line that are relevant to a given keyword, and can get creative with the text to target consumers in a more direct fashion. Additionally, these ads can link to landing pages other than just the product listing, such as your storefront or a custom URL containing relevant product galleries. These ads are also cost-per-click, and are a great way to increase overall brand visibility. The most niche ad type, but sometimes the most powerful, is the product display ad. Product display ads can be customized in one of two ways: product targeting or interest targeting. A product display ad that is product targeted will appear on a specific product page, where interest targeted ads have a more general scope and can appear with anything related to your item. This is a good opportunity to address competitors, for example, by setting your product to show up on their listing. This could divert buyers to your item instead, or purchase your item as an addition to that first purchase. For example, if you and your competitor sell waffle irons, you could use a product targeted display ad to run on their page for your brand of waffle iron. Or you could set one of your related products, such as maple syrup, to be advertised with their items. Interest targeted ads, because of their broader audience, are at higher risk of clicks that don’t result in a sale, so being conservative with your keywords is often a safe choice. This is a great ad type to use for driving sales, especially if you offer products that can be strategically advertised alongside related listings or in searches. Sponsored product ads, as we’ve discussed, are the most popular ad type for sellers on Amazon. When beginning a sponsored product ad, Amazon gives you the option to run a manual or automatic campaign. A manual campaign is one that you set up with your own keywords, and an automatic campaign runs off keywords that Amazon matches to your product through several algorithms. Automatic campaigns consider your product’s category, description, existing keywords, and related products to determine which terms to use for your campaign. It isn’t the most accurate system, but is immensely useful in discovering what people are commonly searching for when they buy your product. An example of a long-tail search term a person might input to narrow down their results could be “low brim black hat cotton red ribbon warm fall season,” which combines all their desired search terms into one clump of information. While it seems like a very niche phrase to consider for a manual campaign, this search term often results in more sales than the broader phrase and is therefore important to include. Running two campaigns might seem like a lot, but it is the optimal strategy for most businesses. Especially when debuting a new item, which may not have as many obvious keywords associated with a more common type of item, running an automatic campaign can create a steady stream of functional keywords to plug into a manual campaign later. Without an automatic campaign, it is entirely up to you which keywords to bid on. This is helpful for more advanced advertisers, as it allows you to create your own individual bids on keywords instead of letting Amazon determine them and potentially waste money on low-CTR keywords. However, automatic campaigns are constantly refreshed with new searches, and can keep you on top of developments in what buyers are actively searching for. A manual campaign is more likely to go static, unless you are updating and revisiting keywords constantly. Keywords are a crucial part of any ad campaign, as they establish what search terms your ad appears with. Amazon uses a bidding system to secure certain keywords in your campaign, and portions of your budget are allocated to bidding on them. Popular keywords are more expensive, and those generally include broad-scope search terms or words related to products that are popular in current culture. Adding the keyword “Apple” to your ad campaign, for example, could be very costly as Apple brand products are very popular. The best strategy to avoid sinking too much money into purchasing keywords is to narrow your scope down to search terms that will most likely result in a sale. It is tempting to fill your campaign with hot keywords in the hope for greater visibility, but this often results in click-throughs that don’t end in a sale. So, you’re out a fair chunk of ad budget - and the consumer didn’t even make a purchase. Instead, try to narrow your terms down to what you think your customer is actively searching when wanting to buy your product. Amazon’s keyword organization is great for just this purpose, as it is divided into four types: broad match, phrase, exact, and negative. Broad match keywords will connect your ad to products containing your phrase, but also anything related to it. For example, if you are selling Jurassic Park backpacks, a broad keyword such as “Jurassic Park” will connect your product to synonyms, misspellings, and related terms. While this may sound like the best option, your product can wind up advertised on search terms that are only slightly related, such as “dinosaur” or “park” searches. It’s unlikely that these terms will result in a sale for your specific product. Phrase keywords narrow the scope by only targeting searches with your whole phrase included, as well as common misspellings. This means that your whole phrase will stay intact, but may show up in searches with words after or before it. So, “Jurassic Park backpacks” will always have the phrase “Jurassic Park backpacks” included, regardless of what comes before or after it. This prevents your items from being shown to people who are not in the market for your specific product, but does not display your ad in relevant searches without the phrase, such as “Jurassic Park bags.” This keyword could result in a sale, but is missed when using phrase match. The most narrow keyword type is the exact match, which very simply targets only your specific phrase, as well as plurals and misspellings. It will not appear in searches that include other words, even if they are before or after the phrase. This ensures your product will be seen by your most likely buyer, but misses out on the opportunity to advertise to people who may not explicitly be looking for your product but would be interested in purchasing it. Using a fair mix of each type of keyword is often the best strategy, and can be narrowed down with the use of negative keywords. A negative keyword specifies where your product will not show up, and can be used to whittle down broader search terms. For example, if you are selling Jurassic Park backpacks and have used the broad search term “backpack,” you likely do not want your ad running on pages for “hiking backpack.” That is a different type of product altogether, and it is very unlikely that people searching for that kind of pack will buy your product. So, adding “hiking backpack” to your negative keywords allows you to keep your broad keyword, without advertising on the wrong kinds of pages. Aside from keyword optimization and budgeting, your Amazon ads hinge on your ability to qualify for the buy box. The buy box is the coveted space on a product page that consumers click through to add items to their cart or purchase instantly. 82% of purchases are completed through the buy box, so it’s pretty important that you own it. The buy box is in green, and sellers who do not own the buy box end up in the red box at the bottom, where they are less likely to receive sales. In fact, if you do not own the buy box, Amazon will stop running your Sponsored Ads entirely. This sounds bad, but you really don’t want ads running when you don’t own the buy box. Customers who click your ad while you don’t own it will wind up purchasing from the competitor who does. Amazon doesn’t stop your sponsored brand ads, though, which will also lead traffic to a sale you won’t make if you aren’t in the buy box. Earlier we mentioned that the buy box is earned by sellers who are active for 3 months and have had a record of high performance, but what does that mean? To Amazon, it means a lot. Amazon takes in quite a few metrics to determine who is most fit for the buy box. The buy box, according to Amazon, should belong to the seller that exemplifies the best qualities of an online merchant: fast shipping, low prices, always in-stock, and rated well by customers. The latter ratings are gathered from your seller rating, product rating, and how customers rank their experiences with your customer service. Having products in stock make you a reliable seller, as does having consistent competitive pricing. Your shipping options factor into customer satisfaction very heavily, as the average consumer expects three-day shipping as a standard. The best way to get an edge in the marketplace to solve this problem is to have Amazon fulfill your product shipping. Shipping with Amazon Fulfillment (FBA) not only increases your chances of owning the buy box, as Amazon is more likely to approve you when they can verify your ability to ship, but customers are more likely to trust FBA sellers. Amazon stores your inventory, packs and ships it, and handles any customer returns with their easy return system to guarantee a high standard of service. The ownership of the buy box fluctuates very frequently, and it would be accurate to say that any given seller can own a share of the buy box. This means that a dominant competitor could have the buy box for 70% of the day, but the buyer just below them could own it for the remaining 30% of the day. Amazon uses advanced algorithms to constantly update its buy box standards, so no business is guaranteed absolute control over the buy box. If your margins dip in any of the metrics Amazon uses to qualify you, you can easily lose your spot in the buy box. The final step you should take in your ad campaign is determining your budget. You have your ad type, product, and keywords chosen, so it is now time to budget your campaign correctly. What those numbers look like differ between business types, how long the business has been active on Amazon, and what is considered sustainable based on their sales. A company that is new to online retail might have to put more money into advertising to generate brand recognition, or may want to spend conservatively until they get a good feel for the marketplace. More established brands may not have to spend much to gain recognition, but should consider advertising as a strategic way to control the buy box and compete with other sellers. An easy way to get a feel for your budget is to calculate what your ACoS should be. The ACoS is the “Advertising Cost of Sale,” and is calculated by dividing your total ad spend by your ad-attributed sales. Amazon shows your ACoS as a percentage in your ad campaign, so you can always keep track of how much money you’re making after ad costs. For example, if you spent $5 on an ad that resulted in a $20 sale, your ACoS would be 25%. The general rule of thumb is that your ACoS should be no higher than your profit margin. To calculate your profit margin, you must take a few things into account. Any fees you pay before the sale of your product should factor into determining your overall profit. The cost of shipping, how much you paid the distributor, any Amazon fees, the overhead costs of your business, and sales tax must be deducted from your selling price. Whatever is left represents your profit margin, or how much you profit from a sale. This is an important number to know not just to determine a sustainable selling price for your item, but also to determine your ACoS. Consider your ACoS as another fee to add on to the sale of your item. If you have a 26% profit margin but you have a 30% ACoS on your ad campaign, you are losing money. It’s best to keep your ACoS lower than your profit margin, because the lower that is the more you get to keep from your initial profits. However, this doesn’t mean you should push your ACoS as low as it can go. Many sellers utilize a “break-even” strategy when beginning an ad campaign. Especially for a new product, or for a business that doesn’t have a very strong reputation online, it is typically best to spend more on your ad campaign at first to gain that visibility. Your ACoS may suffer, but over time you are racking up credibility and useful keywords to drive a more sustainable campaign with a lower ACoS. However, you must still be careful not to tip your profit margin. Breaking even, like having a 26% profit margin and a 26% ACoS, does not harm your business as much as spending over your profit margin, which can be easy to do if you do not pay attention to your ads. Typically, ad campaigns get worse before they get better. Many sellers have a high percentage ACoS for several weeks or months while they begin their campaign, even to the point of losing money. This can be discouraging to some, but with careful diligence it can easily be crafted into a profitable campaign. Over time, as you develop a more customized campaign and amass enough brand visibility to be a well-established seller, you could see your ACoS dip while your sales remain steady or even increase. The following is a great example of what an ad campaign looks like during its lifespan. We began a campaign for our brand partner, Brand A, in February 2018 for a sponsored product ad. As you can see, our initial ACoS was pretty high, and almost all of our budget was placed into an automatic campaign. This is because we needed to discover working keywords through that automatic campaign, and plug them into our manual campaign. Over time, we got our ACoS to a stable point but our sales continued to grow. The manual campaign started small, but after gaining a large amount of data from our initial, more costly automatic campaign we were able to increase our profits and lower ad spend. What caused this campaign to change the way it did? First, it was patience. A campaign must have time to gather sales data to make an informed decision on your budget, and to gather keywords to make an informed decision about your keyword bidding. Additionally, it takes time to gain brand recognition. You generally can’t become a hit-seller overnight, and you want to be careful about pouring out a full-fledged campaign too quickly and being the annoying ad customers see on every page. Discerning customers are aware when they’re seeing a frequent ad, and are less likely to give it a second thought. In the end, it is patience, diligence, and knowing your audience that makes for a successful ad campaign. Advertising on Amazon is key for any business to gain traction or hold their place in the world of online retail. Things move quickly, however, so knowing how and when to establish your ad campaigns is a matter of diligence. Not every strategy is right for your business, and one that works this month might not be your best bet next month. Even Amazon’s methods of advertising are changing, with testing cross-site ads and the recent introduction of video capabilities, it is immensely important to trust your campaign to someone with a quick eye for market changes that can foresee developments. With a stronger understanding of ad types, how keywords impact your success, and how to anticipate your budget, you can try your hand at your own ad campaign!